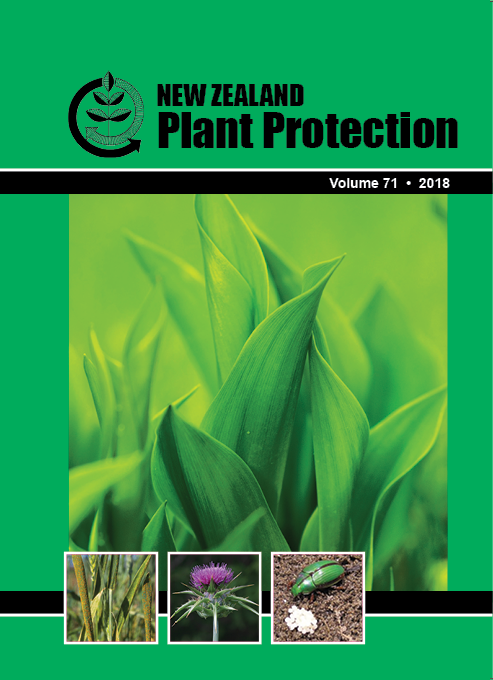 Rust diseases are serious threats to New Zealand cereal crops. Beside the use of fungicides, resistant varieties are an important option for managing these diseases. Changes in rust pathotypes commonly occur due to mutations in existing populations or exotic incursions. Information on these changes is the basis of gene-based disease management. Rust-infected leaves were collected from cereal crops from 2012 to 2015. The pathotypes of these and some historic samples were determined in glasshouse studies, using specific differential host sets. Eight pathotypes of Puccinia triticina (Pt, causal agent of wheat leaf rust), five of P. striiformis f. sp. tritici (Pst, causal agent of wheat stripe rust) and two of P. hordei (Ph, causal agent of barley leaf rust) were identified. The Pst ‘WA’ pathotype was most frequently found. Wheat varieties ‘Empress’ and ‘Torch’, previously resistant to Pt, were found to be susceptible to leaf rust for the first time. The ‘WA’ pathotype of Pst is likely to have arrived in New Zealand from Australia, and is now widespread. The two Pt pathotypes could have overcome resistance gene Lr24 in ‘Empress’ and ‘Torch’.